They are a lot more entrepreneurs today than ever and a number of circumstances have led to the rise. High unemployment rate and other factors like independence and free control have led many to this route. With this we see young entrepreneurs and SME’s coming up on a daily basis. Start up’s, SME’s and young entrepreneurs should be excited about this empowerment initiative by Diamond Bank. 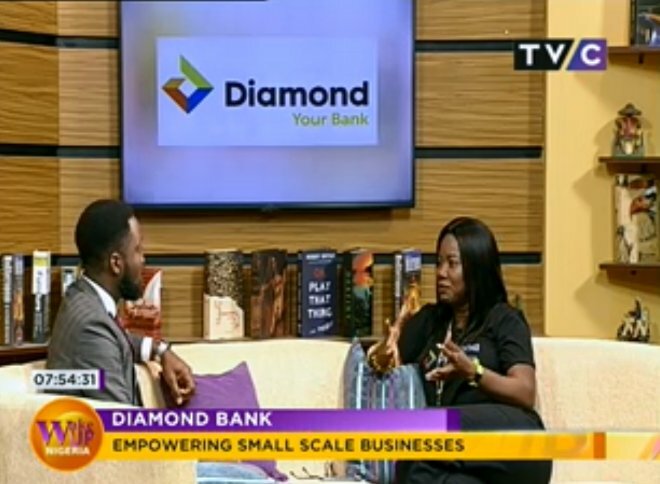 Head Emerging Businesses, Diamond Bank, Mrs Ayodele olojede was on Wake Up Nigeria with Yomi Owope to put entrepreneurs through on the Building Entrepreneurs Today (BET) initiative by Diamond Bank. Despite the harsh business operating environment and challenges of SME’s in Nigeria, Diamond Bank had started a program to support the development of businesses. About 95% of SME’s do not have their business name registered and this can automatically create a finance gap. No business plan which contributes to failure of businesses. As a Small medium sized enterprise what will determin eow successful you are regardless of talent is your ability to sell your product. This is because when a bank loans money for your busines, they expect you have the ability to pay back. “Then on the other hand, as a bank we know SME’s don’t have the recognized type of colleteral traditionally accepted by banks”. However, Diamond bank has started a lending program to provide funding for the SME’s exposing them to different initiatives to develop their businesses. The access to knowledge initiative by Diamond Bank: The SME’s need to understand how to better run their business. The BET program from Diamond Bank: Teaches how to become a successful businessman, how to keep your books and how to takes opportunities as a businessman. However as a young entrepreneur, start up or Small Medium sized enterprise (SME) and need access to the BET program, visit any Diamond bank branch and ask for an SME bank representative for registrative an follow up the process.